In their posthumous award to Dr. Sagan of their highest honor, the National Science Foundation declared that his research transformed planetary science ... his gifts to mankind were infinite. New York: Random House, 1980. First edition of one of the best-selling science books ever published. Octavo, original cloth, illustrated. Signed by Carl Sagan on the title page. Fine in a near fine price-clipped dust jacket. Jacket design by Robert Aulicino, jacket painting by Adolph Schaller. Signed first printings are rare. Cosmos is the best-selling science book ever published in the English language. Brilliant and provocative, it traces today's knowledge and scientific methods to their historical roots, blending science and philosophy in a wholly energetic and irresistible way. "Enticing, imaginative, readable, iridescent" (The New York Times). It was also a thirteen-part television series written by Carl Sagan, Ann Druyan, and Steven Soter, with Sagan as presenter. It was executive-produced by Adrian Malone, produced by David Kennard, Geoffrey Haines-Stiles, and Gregory Andorfer, and directed by the producers, David Oyster, Richard Wells, Tom Weidlinger, and others. It covers a wide range of scientific subjects, including the origin of life and a perspective of our place in the universe. The series was first broadcast by the Public Broadcasting Service in 1980, and was the most widely watched series in the history of American public television until The Civil War. As of 2009, it was still the most widely watched PBS series in the world. It went on to win two Emmys and a Peabody Award, and has since been broadcast in more than 60 countries and seen by over 500 million people. It was followed-up by the 2014 documentary television series bearing the same name presented by astrophysicist Neil deGrasse Tyson, who, as a young high school student, was inspired by Sagan. New York: Random House, 1980. First edition of one of the best-selling science books ever published. Octavo, original half cloth. Presentation copy, inscribed by the author on the half-title page, "For the Collins family With best wishes Carl Sagan 9/20/95." Fine a very good dust jacket. Jacket design by Robert Aulicino, jacket painting by Adolph Schaller. Cosmos is the best-selling science book ever published in the English language. Brilliant and provocative, it traces today's knowledge and scientific methods to their historical roots, blending science and philosophy in a wholly energetic and irresistible way. "Enticing, imaginative, readable, iridescent" (The New York Times). It was also a thirteen-part television series written by Carl Sagan, Ann Druyan, and Steven Soter, with Sagan as presenter. It was executive-produced by Adrian Malone, produced by David Kennard, Geoffrey Haines-Stiles, and Gregory Andorfer, and directed by the producers, David Oyster, Richard Wells, Tom Weidlinger, and others. It covers a wide range of scientific subjects, including the origin of life and a perspective of our place in the universe. The series was first broadcast by the Public Broadcasting Service in 1980, and was the most widely watched series in the history of American public television until The Civil War. As of 2009, it was still the most widely watched PBS series in the world. It went on to win two Emmys and a Peabody Award, and has since been broadcast in more than 60 countries and seen by over 500 million people. It was followed-up by the 2014 documentary television series bearing the same name presented by astrophysicist Neil deGrasse Tyson, who, as a young high school student, was inspired by Sagan. Barcelona: Editorial Planeta, 1980. First Spanish edition of one of the best-selling science books ever published. Octavo, original illustrated wrappers as issued. Inscribed by the author on the title page, "Por Cara Shirley Con amore y admiracion Carl." The recipient was Shirley Arden, who was the executive secretary to Sagan and close friends of Sagan. Cosmos is the best-selling science book ever published in the English language. Brilliant and provocative, it traces today's knowledge and scientific methods to their historical roots, blending science and philosophy in a wholly energetic and irresistible way. "Enticing, imaginative, readable, iridescent" (The New York Times). It received the Hugo Award for Best Non-Fiction Book. It was also a thirteen-part television series written by Carl Sagan, Ann Druyan, and Steven Soter, with Sagan as presenter. It was executive-produced by Adrian Malone, produced by David Kennard, Geoffrey Haines-Stiles, and Gregory Andorfer, and directed by the producers, David Oyster, Richard Wells, Tom Weidlinger, and others. It covers a wide range of scientific subjects, including the origin of life and a perspective of our place in the universe. The series was first broadcast by the Public Broadcasting Service in 1980, and was the most widely watched series in the history of American public television until The Civil War. As of 2009, it was still the most widely watched PBS series in the world. It went on to win two Emmys and a Peabody Award, and has since been broadcast in more than 60 countries and seen by over 500 million people. It was followed-up by the 2014 documentary television series bearing the same name presented by astrophysicist Neil deGrasse Tyson, who, as a young high school student, was inspired by Sagan. Easton Press, 2002-01-01. Leather Bound. New. 11.5000 inches 9.9000 inches. Random House, 1980-10-12. Hardcover. Near-Fine/Very Good. Signed. 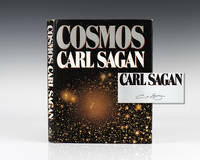 SIGNED BY CARL SAGAN, PROFESSIONALLY AUTHENTICATED BY PSA/DNA! Also a brief personal inscription including "with best wishes." A lovely 6th printing in near-fine / very good condition; price intact DJ looks terrific in new mylar. Includes a full Letter of Authenticity from PSA. Expedited and international shipping are welcome; signed by author. Random House, 1983-01-01. Paperback. Used:Good. Norwalk, Connecticut: Easton Press. 2002. First Edition; First Printing. Hardcover. Some area's of light rubbing to the gilt else Near Fine, Accented in 22kt gold, printed on archival paper with gilded edges, smyth sewing & concealed muslin joints. Bound In full leather with hubbed spines. ; Easton Press Science Classics; 8vo 8" - 9" tall . New York: Random House. 1980. First Edition; First Printing. Hardcover. 0394502949 . Near Fine in a Near Fine price clipped dust jacket. First Edition stated. ; 10 X 7.90 X 1.20 inches; 365 pages; Original dust jacket protected by archival Brodart cover. All domestic orders shipped protected in a Box. .
New York: Random House. 1980. First Edition; First Printing. Hardcover. 0394502949 . Near Fine in a Very Good price clipped dust jacket. A few short tears to spine ends. First Edition stated. ; 8vo - over 7¾" - 9¾" tall; 365 pages; Original dust jacket protected by archival Brodart cover. All domestic orders shipped protected in a Box. .
1995-02-04. New. Ships with Tracking Number! INTERNATIONAL WORLDWIDE Shipping available. Buy with confidence, excellent customer service! 2002-05-09. New. Ships with Tracking Number! INTERNATIONAL WORLDWIDE Shipping available. Buy with confidence, excellent customer service! Norwalk Connecticut: Easton Press. 2002. First Edition; First Printing. Hardcover. Near Fine, Accented in 22kt gold, printed on archival paper with gilded edges, smyth sewing & concealed muslin joints. Bound In full leather with hubbed spines. ; 4to 11" - 13" tall . 1980-03-09. New. Ships with Tracking Number! INTERNATIONAL WORLDWIDE Shipping available. Buy with confidence, excellent customer service! Planeta S A Editorial. Hardcover. 8408053043 Like New Condition. . Fine. Planeta S A Editorial. Hardcover. 8408053043 New Condition. . New. New York: Random House. 1980. First Edition; First Printing. Hardcover. 0394502949 . Book condition is Very Good; with a Very Good dust jacket. Edgewear to jacket, inlcuding a few short tears. Minimal foxing. No markings to text, illustrated thoughout. First Edition is stated. ; Small 4to 9" - 11" tall; 365 pages . Norwalk, Conn.: Easton Press. New with no dust jacket. 2002. Hardcover. Brown full leather titled/decorated in gilt, all edges gilt, silk ribbon marker, moire endpages, raised spine bands. New in shrinkwrap in original box. Bookplate available on request. ; 4to 11" - 13" tall . 1983-03-07. New. Ships with Tracking Number! INTERNATIONAL WORLDWIDE Shipping available. Buy with confidence, excellent customer service! Abacus. PAPERBACK. 0349107033 Brand new book.Buy with confidence. Money Back Guarantee.Expedite Shipping Available. International shipment available. . New. Ballantine Books. PAPERBACK. 0345539435 Brand new book.Buy with confidence. Money Back Guarantee.Expedite Shipping Available. International shipment available. . New. 1983-09-08. New. Ships with Tracking Number! INTERNATIONAL WORLDWIDE Shipping available. Buy with confidence, excellent customer service! 1985-02-05. New. Ships with Tracking Number! INTERNATIONAL WORLDWIDE Shipping available. Buy with confidence, excellent customer service! 2017-01-08. New. Ships with Tracking Number! INTERNATIONAL WORLDWIDE Shipping available. Buy with confidence, excellent customer service! 2017-01-08. Good. Ships with Tracking Number! INTERNATIONAL WORLDWIDE Shipping available. May not contain Access Codes or Supplements. May be ex-library. Shipping & Handling by region. Buy with confidence, excellent customer service! Random House. Hardcover. 0394502949 New Condition *** Right Off the Shelf | Ships within 2 Business Days ~~~ Customer Service Is Our Top Priority! - Thank you for LOOKING :-) . New. 2017-03-06. New. Ships with Tracking Number! INTERNATIONAL WORLDWIDE Shipping available. Buy with confidence, excellent customer service! Random House, 1980 Hardcover 1st Ed (stated) 1st Printing (full # line) in original $19.95-priced dust jacket in new condition, no remainder mark, bright tight as new copy; from the collection of renowned science fiction writer Poul Anderson (dj in mylar protector); sm 4to; 365pp indexed & illus. Extra shipping charge REQUIRED for priority or overseas delivery of this heavy oversize book (extra charge SUBSTANTIAL for overseas shipment). First Edition. Hard Cover. New/New. New York: Random House. 1980. Book Club Edition. Hardcover. 0394502949 . Very Good+ in a Fair dust jacket. Creasing to upper and lower edges of front and rear panels. Open tear to upper rear panels. Chip to upper rear panel. Edge wear. Wear to crown and heel. Price clipped stated first edition with full line to 2 sill looks like a BCE. ; 10 X 7.90 X 1.20 inches; 365 pages; Original dust jacket protected by archival Brodart cover. All domestic orders shipped protected in a Box. .
New York: Random House. 1980. Hardcover. 0394502949 . Near Fine in a Good dust jacket. Scuffing to panels. Chips to crown and heel. Edge wear. ; 10 X 7.90 X 1.20 inches; 365 pages; Original unclipped dust jacket protected by archival Brodart cover. All domestic orders shipped protected in a Box. .
New York: Random House. 1980. First Edition; Third Printing. Hardcover. 0394502949 . Very Good in a Very Good dust jacket. Edge wear with chips and tears along the top of the the front, back and spine of jacket. This includes a thumb sized chips at the top back cover. ; 10 X 7.90 X 1.20 inches; 365 pages; Original unclipped dust jacket protected by archival Brodart cover. All domestic orders shipped protected in a Box. .
1981-01-06. Good. Ships with Tracking Number! INTERNATIONAL WORLDWIDE Shipping available. May not contain Access Codes or Supplements. May be ex-library. Shipping & Handling by region. Buy with confidence, excellent customer service! Wings Books [Random House Value Pub], 1995-01-01. Second Printing. Hardcover. Used:Good. 2017-03-06. Good. Ships with Tracking Number! INTERNATIONAL WORLDWIDE Shipping available. May not contain Access Codes or Supplements. May be ex-library. Shipping & Handling by region. Buy with confidence, excellent customer service! 1983-07-06. Good. Ships with Tracking Number! INTERNATIONAL WORLDWIDE Shipping available. May not contain Access Codes or Supplements. May be ex-library. Shipping & Handling by region. Buy with confidence, excellent customer service! Random House, 2002-05-07. Random Hou. Hardcover. Used:Good. Random House, 1980-10-12. Hardcover. Used:Good. New York: Random House, 1980. A First Edition, First Printing. Soft cover. Near Fine/Very Good or Better. Near fine and appears unread in a very good or better unclipped dust jacket. Volume with light edge wear, else near fine in all respects. Jacket with a little wear to spine tips, two tiny teats at the top of the front panel, wear with some loss to the top rear corner. Random House, 1980-10-12. Hardcover. Like New/Very Good. 1980 edition, book reflects age. Book has shelf wear from storage and use, small tear to the bottom front of the rear dust jacket; otherwise the book is in very good condition.